By now everyone is familiar with Samsung’s exploding Galaxy Note 7s. Losses from the fiasco were estimated to be in the billions. 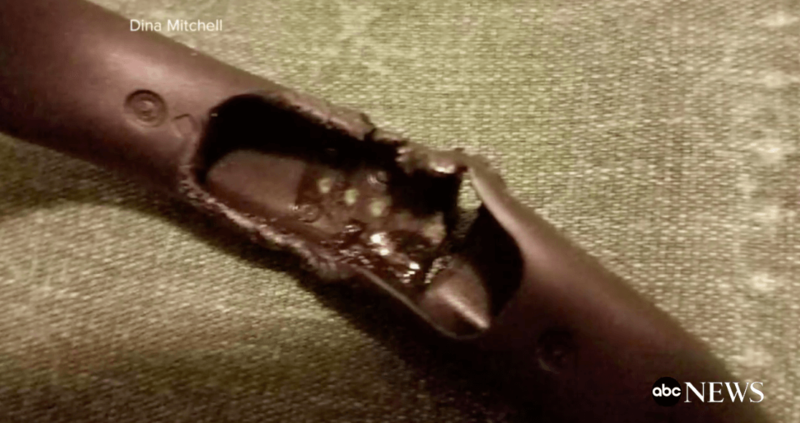 Now ABC News reports that a Wisconsin woman has suffered second-degree burns from her Fitbit Flex 2 when it exploded on her wrist. According to Fitbit's website, the Flex 2 is a wearable fitness tracker that is worn like a bracelet. It tracks your activity, and even your sleep then sends notifications and data to an app on your mobile device. The battery can go for five days without needing to be recharged, and it is intended to be worn 24/7, including while swimming or bathing since it is waterproof. Dina Mitchell claims that the device burst into flames while she was reading. She had only owned the device for two weeks. In an email to ABC, Mitchell explained, "I was literally just sitting and reading when my Fitbit exploded. It was either defective or really mad I was sitting still so long… I don’t know. Either way, It burned the heck out of my arm." Although she removed the Fitbit tracker immediately, it still burned her bad enough that her doctor had to remove melted bits of the device from her arm. Dina contacted Fitbit about the incident, and they offered to replace her device. It is unknown if she took them up on their offer. The company voiced concern over the incident. It is investigating the situation and issued a statement to ABC News. "We are extremely concerned about Ms. Mitchell’s report regarding her Flex 2 and take it very seriously, as the health and safety of our customers is our top priority. We are not aware of any other complaints of this nature and see no reason for people to stop wearing their Flex 2." Fitbit also promised to keep the public apprised of anything it finds in its investigation. Hopefully, for its sake, this is an isolated occurrence, but expect hoax incidents to spring up looking to make a quick buck.